It began with Hollywood as William A. Wellman and Robert Carson won an Oscar for their story about a young actress dreaming of super stardom in 1937. From there it went the way of the movie musical thanks to Judy Garland taking the lead before earning six nominations in 1954. Next came Barbra Streisand and Kris Kristofferson to shift things to the music world with its aging rock star and hopeful songstress adding a 1976 Best Song to the awards cabinet. 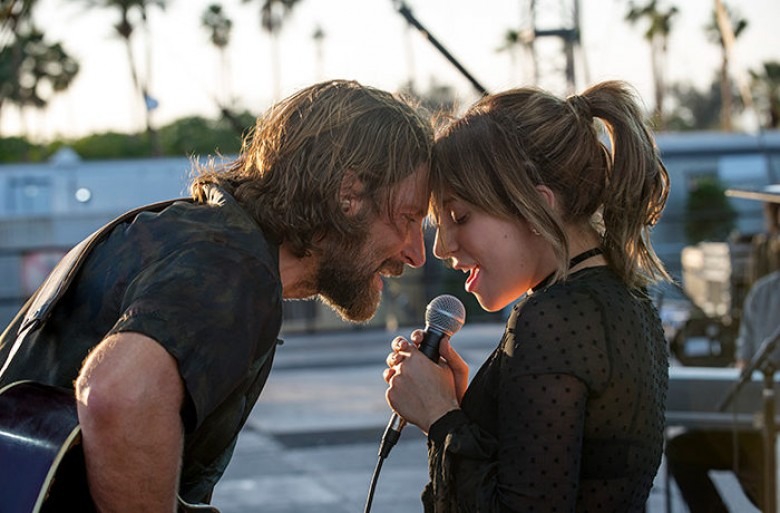 Now—almost a full century after its first iteration—arrives a new A Star Is Born upgraded to folk rock stadium insanity and pop world theatrics courtesy of first-time writer/director Bradley Cooper and six-time Grammy Award winner Lady Gaga. And somehow it isn’t just a vanity project. Let’s be honest. That’s exactly what we thought when it was announced that Cooper had taken over top to bottom creative duties. Here he was stepping in for Clint Eastwood after production was delayed because of original lead Beyoncé‘s pregnancy, receiving this promotion after having been attached to star as its aging depressive alcoholic for three years. If this leap showed anything it was passion because he could have easily let the film fall apart. Instead he took the reins, saw Gaga come join a few months after her surprising Golden Globes acting win, and brought Willie Nelson‘s son Lukas Nelson aboard to help write the music. One trailer later and its award aspirations were revealed to the world. It might win some of them too. Co-writer Will Fetters (with Cooper and Eric Roth) has been quoted as saying the role of Jackson Maine (Cooper) was inspired by Kurt Cobain and the types of demons he would have carried with him to middle age had he not committed suicide. I get the comparison, but a twenty years younger version of Jeff Bridgescharacter in Crazy Heart (while his career was still booming despite an approaching decline) is probably more apt. Maine hasn’t lost his stadium show top-billing yet nor has he earned back anonymity in a twentieth century rife with camera phones constantly flashing in his face. His songs are on the jukebox and he’s recognized at the bar he stumbles into with nothing but alcohol on his mind. That’s where he sees her. 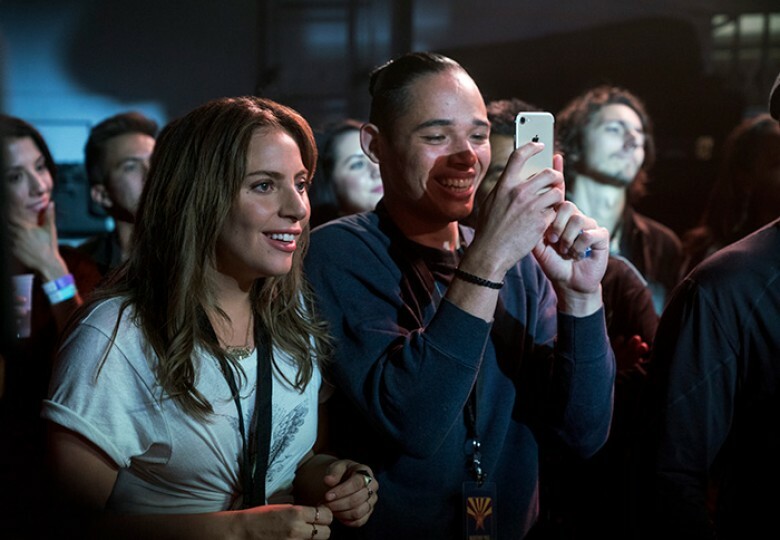 Ally (Gaga) is a small town girl who lives with her father (Andrew Dice Clay‘s Lorenzo) and sings whenever the drag queens at the dive she used to serve at let her go onstage to share her voice with the locals. It just so happens this was one of those nights, fate making sure her best friend Ramon (Anthony Ramos) was the man who greeted Jack at the door to offer a measured dose of excitement and the promise of a performance he wouldn’t regret sticking around to watch. From there it’s introductions, a lowering of defenses, and an honest conversation about talent, opportunity, and confidence. A whirlwind of emotion, empowerment, and the desire to fight regret with hope culminates in Ally onstage belting her lyrics to thousands. It’s a fantastic opening act with radio-ready songs (“The Shallow” is a legit single), slomotion meet cute aesthetic, and ample exposition to enter the headspace of these two talents and the dark inspiration for their art. We believe it when Maine’s manager Bobby (Sam Elliott) tells Ally he hasn’t seen him play like this in years. We know Jack’s drinking will eventually put him in a coffin if having her in his life doesn’t change things soon. And it’s inevitable her impending fame will keep them separated long enough to ensure that salvation will forever remain a question looming above their successes. He’s not the only one with insecurities, though. Ally hopes to sing while new manager (Rafi Gavron‘s Rez) looks to transform her into a pop icon. Enter act two: the one flaw of an otherwise impeccable whole. It’s here where focus gets muddled because what had been an even split of the spotlight turns one-sided quick. While you’d assume this shift would push Jack to the background in order to turn attention onto Ally, however, the opposite is true. That battle between “art” and “commercialization” being set up for her to combat? It turns out she embraces the metamorphosis. Without any real inner turmoil on her part, this entire portion of the film becomes almost laughably rushed with Ally earning a single, album, tour, and nominations almost overnight. It would have been better if Cooper just cut to black after that first concert and rejoined them years later to watch the fallout. The only reason he doesn’t is because Jack doesn’t approve of her transformation. A mix of jealousy, loneliness, and existential dread drops him farther towards the bottom of the bottle and ultimately renders her character a pawn in his story rather than the star of her own. Suddenly everything she does is put through a lens of how it affects Jack. Here’s the vanity part for Cooper. His role is objectively more dramatic with a “deeper” arc towards tragedy and thus does deserve the time necessary to portray those really harrowing moments of him being haunted by too much to let Ally and Bobby make a dent. It’s merely unfortunate because Gaga had already earned our attention. To therefore watch her become a prop is disappointing. Things even out a bit by the end to reinstate their equal footing, but Jack’s struggles have definitely overshadowed Ally’s success as far as intrigue goes. The one thing that’s never diminished, though, is their love. 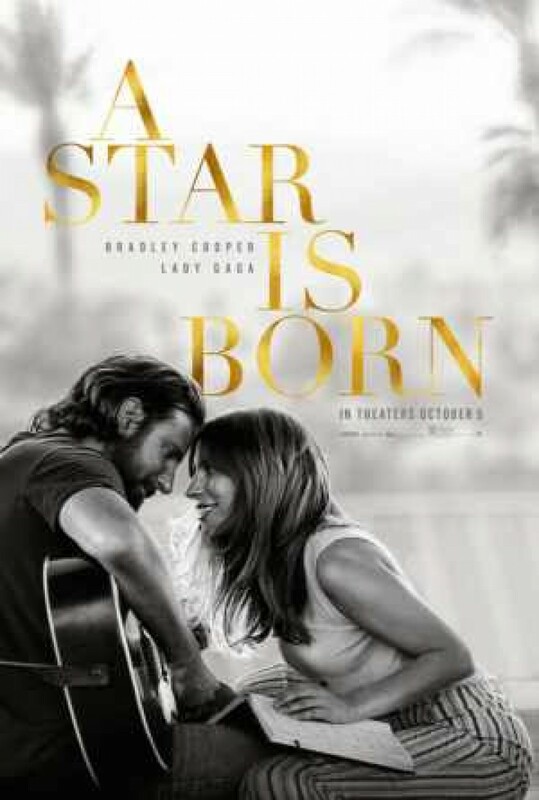 It shines through Cooper and Gaga’s performances (both shoo-ins for nominations if not victories) and the music with relevant lyrics proving crucial to their characters’ mindsets and our emotional reaction to what occurs. And everything looks great too from the concert scenes (Live Nation is a producer with their logo prominently shown at the start) to the little moments where Jack and Ally are simply gazing into each other’s eyes. Throw in some dynamite supporting players (Clay and Elliott are both worthy of praise) and you have a winner through and through. It’s therefore easy to look past the middle third’s shakiness because where it’s leading is enough. Gaga’s character’s increasing confidence runs parallel with her own so thankfully she does get to shine later through her continuous refusal to let Jack’s disease be an excuse—something a throwaway line has us believing is a result of her childhood with Dad. Ally ensures she will not be the victim early on and this is a refreshing detail to counterbalance how she’s used to impact Jack’s trajectory by never losing her own agency even if the film briefly forgets it. That strength makes her a formidable ally (I hope that wasn’t intentional) rather than foe since Cooper’s portrayal of psychological defeat is authentically devastating. They’re stronger together, but sometimes love isn’t enough.